Bruce Betting occasionally offer a very profitable promotion called Lead at the Last. If you're horse is winning when it jumps the final fence but then goes on to not actually win, Brucebetting will still pay out as if you're horse has won the race, up to a max of £100. This promotion is only on chosen venues and isn't posted very often (some weeks they'll have the offer on 2 or 3 times, other weeks they won't have it on at all). To find out what races they are offering this promotion on, visit the promotions page here. To get the maximum out of this offer, you need to have TOTAL RETURNS of £100 (this includes your stake - so if you bet £20 at 5.0 that'd return a total of £100 which is the max. If you bet £20 at 6.0 you'd get a total return of £120 so would still only receive £100 if your bet loses). Open up Bruce Betting and your exchange and find a close match between the back and lay odds of any horse. 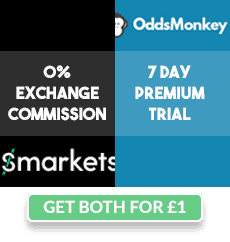 Alternatively you can use Oddsmonkey's Oddsmatcher to filter out Horse Racing, or their Racing Matcher to check the odds on every race. It's usually good to go for one of the favourites (the lowest odds) as they have a bigger chance of being ahead towards the end. I prefer trying to go for a second or third favourite, and hope the actual favourite beats them right at the end. Calculate £100 ÷ odds of horse (for example, a horse at odds of 6.0 will be £16.66 stake - you may want to round it up or down). Bear in mind your max stake is £20, so any horse under the odds of 5.0 will not be able to pay out the max amount of £100. I tend to stick to £20 stakes even if a horse is higher odds otherwise you might stand out as only taking bonuses if you're betting irregular amounts. Try to keep your qualifying loss around £2 max. Stake the required amount on the horse. Try to back as early in the day as possible for a chance at best odds guaranteed. A move of 1.0 on the bookmaker at £20 stake would be £20 profit if it wins the race. If your horse is winning when it jumps the final fence and then goes on to lose, your bet gets paid out as a win anyway up to £100 (So you win both your back and lay bet!). Winnings aren't normally paid out until the next day around 12 noon. To see if you've been paid click Your Name > Account details. Betway also tend to run the exact same offer, so you can sometimes cover a couple of horses in the same race. It's best to go for close matches, but it's also a good idea to go for the 2nd and 3rd favourites as they have a higher chance of triggering the offer. You can combine this offer with Bruce's bet club to reduce your qualifying losses by about £8 (as you are receiving a £10 free bet) - it can be found here PUT LINK.